“There is much that impacts our mental wellbeing at this age – how we are treated by our families and friends being critical. Bullying, cyberbullying, coming to terms with our individual gender identity and sexual orientation, family and peer pressures and violence in our communities and the world impact the mental well-being of our youth. It is truly a pleasure to be here today to open Mental Health Awareness week. This is special to me because mental illness – and mental wellbeing – are issues I’m very passionate about personally… And, truthfully, I think we all need to be passionate about this issue. Mental health is often referred to as the “Cinderella issue” – the health issue that didn’t get invited to the ball. Compared to physical health, it is the issue that gets forgotten, overlooked, hidden under a carpet and, worse, buried deep inside suffers and their families for the shame and stigma that comes with it. You don’t hear people whisper in hushed tones, “he broke a leg”. No. He’ll wear a cast like a badge of honour. We don’t feel embarrassed to tell our friends or colleagues, “I had the flu”, or even “I’m diabetic”. Physical health issues are considered “normal” and ok to have. But not so for mental illness. A student who tells a teacher, “I suffer from anxiety sometimes” can feel a terrible burden in admitting this. Adults may regard this as a weakness or an excuse for laziness. An employee who suffers from depression cannot easily explain why they could not go to work that day. Mental ill-health is not something we have come to accept as an ordinary part of life. And for that reason, events like this one, dedicated to raising awareness and brining the issue out from the shadows are extremely important. I’m proud and honoured to help spread that message and tell everyone that it’s ok to hurt sometimes. It’s not a sign of weakness…. And, on the contrary, seeking help, is a sign of strength. Did you know that in our entire lifetime, one in four of us will suffer from a mental illness? Furthermore, research indicates at least half of all mental health disorders appear by the age of 14, and about 75% by the age 24. The skills we learn in life and our experiences growing up are often critical in helping us to either prevent, manage or recover from a mental illness. Also, getting help early is crucial. This is why the theme this year is particularly appropriate – Mental Health And Young People In A Changing World. Knowing that you are not alone, knowing that you can ask for and receive help, knowing that mental health difficulties are a part of life and that treatments work, may save you or your friends’ lives. Growing up in today’s times requires us to learn new skills of resilience and care. 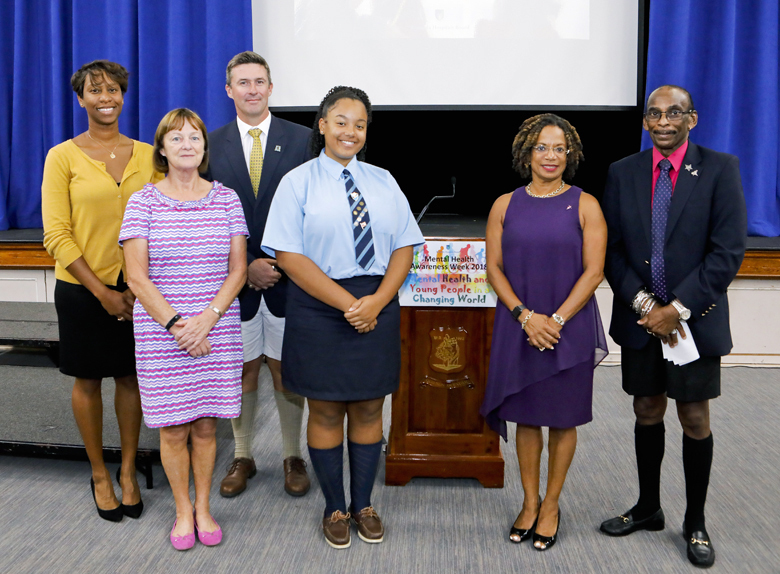 Young people today have exposure to bullying online, and a constant stream of news, both here in Bermuda and globally, through our TVs, our phones and computers. These are new challenges that many teachers and parents did not grow up with. But if we are proactive in education and we empower our children at an early age to be good digital citizens and make informed and responsible choices when they use online media, we can save lives…and, certainly, much emotional distress. Recent research shows us that bullying behaviours hurt not just the victims – but the bullies themselves. Both are in poorer health, job prospects and relationships than the average person. These are real consequences. However, just like getting treatment for an infection or broken limb, you can recover if you seek help. Asking someone if they are thinking of suicide gives them the opportunity to say ‘yes’ and seek help. Please pay attention to friends who may self-harm – as this behaviour also puts them a risk for suicide. In 2017, there were 92 risk assessments conducted at MWI’s Child & Adolescent Services. Risk assessments are undertaken for all children who have made statements of self-harm, or expressed thoughts of self-harm. So listen to your friends. If they seem down, withdrawn, anxious or taking unusual risks, don’t avoid the conversation. In closing, I would like to thank Warwick Academy, for welcoming us here today to launch Mental Health Awareness Week with staff and service users from the Mid-Atlantic Wellness Institute. 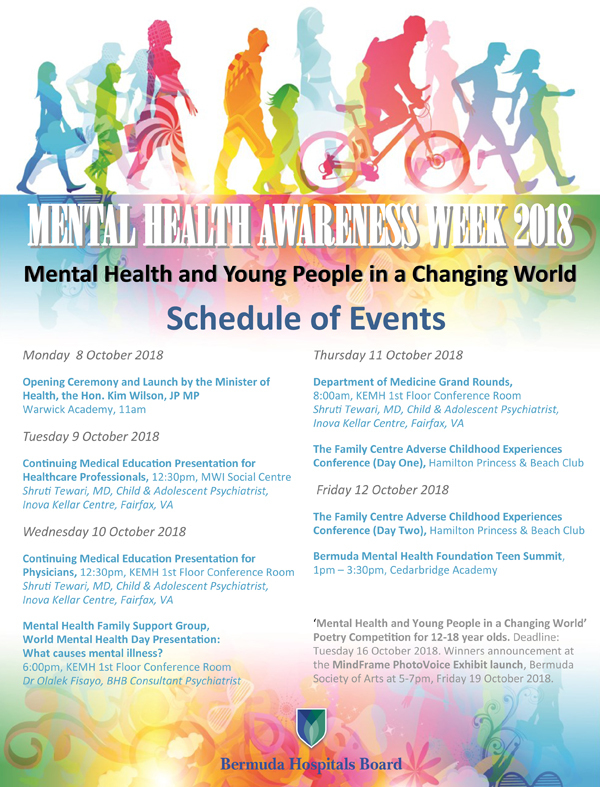 It is wonderful to see Warwick Academy’s approach to educating about mental health issues. With that, I would like to welcome McKenzie-Kohl Tuckett to come and bring the voice of our young people to this launch of mental health awareness 2018. While I am no subject matter expert, it is safe to say that identifying stressors and finding effective coping mechanisms goes a long way in promoting mind-body wellness. School: Teenagers are often told that our school days will be some of the best days of our lives. While that may be true, according to a survey conducted by the American Psychological Association, 45%, nearly half of all teens indicated that they were stressed by school pressures. The pressure to perform well academically was the most significant, followed by the desire to please teachers. In addition, the combination of school work, extra-curricular activities and studying for exams lead to crammed schedules. Teenagers should be encouraged to reach out to their school counsellors if they feel as though they can’t cope. Parents/Family: While there is no better feeling than making your family proud, the challenge is when unrealistic expectations are set. This often leads to burnout, anxiety and low self-esteem. It’s good to push yourself and set goals, but when these goals are unrealistic it can do more harm than good. How does one fix this? By lowering unrealistic expectations, allowing teenagers to accept themselves as they are, assisting them with identifying their unique strengths and encouraging them as they build on those strengths. The unconditional love and unwavering support of family is invaluable. Peers: Not only do teenagers have a strong desire to maintain good relationships with their friend groups, we also want to be accepted and liked. Fitting in is important and we place pretty high values on our social lives. One of our main challenges, however, is that social media has many teenagers making ALL attempts to live up to an unrealistic level of “perfection”. This can lead to strong feelings of inadequacy. Text messages and photos are so easily shared via social media, and depending on their nature, sometimes lead to public humiliation. Unfortunately, there are times when nothing spreads faster than “bad news”. Young people are focused on the likes gained on social media, which can lead to bad choices. Teenagers are able to connect with just about anyone, and a friend is only a friend request away. Having too many fake friends, exposes adolescents and gives them a distorted sense of self-worth. In addition, there is no privacy on social media and many are constantly trying to maintain a make believe image of themselves. Then there is issue of bullying. Those who are bullied are at an increased risk for mental health problems such as depression. Not to mention the possible long-term damage to one’s self-esteem as a result of bullying. Television shows like the Netflix series, “13 Reasons Why” illustrates this. This tv show sends a strong message about the possible consequences of bullying. In closing, we need to change the culture of mental health and make it okay to speak about it. While negative attitudes towards those with mental health challenges are common, overcoming the stigma is a must. The good news is that we are now moving in the right direction. To be healthy as a whole, mental wellness plays a role!